Collecting float samples from Arctic Star’s Timantti Diamond Project in Finland. Source: Arctic Star Exploration Corp.
Shares of Arctic Star Exploration Corp. [ADD-TSXV; ASDZF-OTCQB; 82A1-FSE] were active Thursday March 21 after the company announced the status of a previously announced private placement and the granting of stock options to its directors, employees and consultants. Proceeds are earmarked for the development of the company’s 100%-owned Timantti Diamond Project in Finland. The project is located in the same geological belt of rock approximately 450 km southeast of the Grib Diamond Mine in Russia. Arctic Star said it has discovered three diamondiferous kimberlites that may represent the first finds in a large kimberlite field. In a March 8, 2019 press release, the company said the TSX Venture Exchange had granted a three-week extension in relation to a previously announced private placement of up to 12 million units priced at $0.05 per unit. Gross proceeds were expected to be $600,000. In that press release, the company said it had increased the number of units to be issued to a maximum of 17 million, a move that was expected to increase the proceeds to $850,000. The company also said it had closed the first tranche of the private placement by issuing 5.84 million units, and raising $292,000. On Thursday, the company said the $850,000 private placement has been oversubscribed and the second tranche is expected to close in the next few days. Each unit of the private placement consists of one common share and one non-transferable share purchase warrant. Each warrant will entitle the holder to purchase one additional share for a period of two years from the closing date at an exercise price of $0.08. On Thursday, the company also said it has granted 3.45 million stock options to its director, employees and consultants for the purchase of up to 3.45 million common shares. Each option is exercisable for five years at a price of $0.08 per share. Arctic Star shares rallied on the news, rising 27% or $0.02 to $0.095 on volume of 2.76 million. The 52-week range is $0.035 and 22.5 cents. The shares had previously risen on news that the company had received diamond results from caustic fusion analyses on recent kimberlite discoveries at Timantti. The analyses were conducted on the Grey Wolf kimberlite and Vasa Dykes. Both kimberlite bodies were discovered by excavator and the first results were from samples within the discovery pits. In addition, the company is awaiting caustic fusion analyses results from its diamond drill program. Prior to that announcement, Timantti was comprised of two known diamond-bearing kimberlites: the Black Wolf and White Wolf Kimberlite. The project includes a 243-hectare exploration permit and a 95,700-hectare exploration reservation near the township of Kuusamo in Finland. 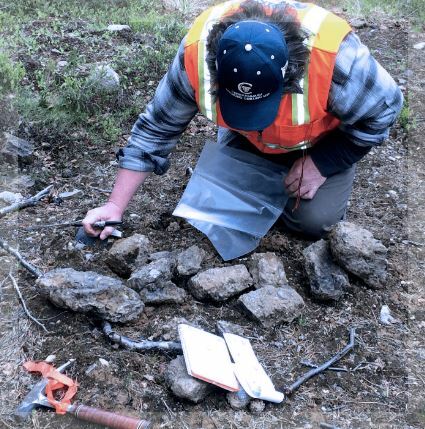 In a February 11, 2019 news release, Arctic Star said it had sold all of its interest in the Carbonatite-Syenite Complex (CAP) Property, located approximately 80 km northwest of Prince George, B.C. Arctic Star sold the property to privately-owned B.C. company, Eagle Bay Resources, in return for 17 million shares (a controlling stake) in Eagle Bay.